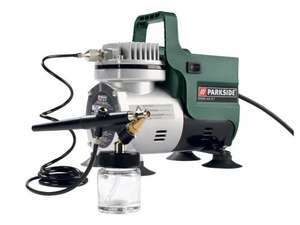 Parkside airbrush with accessories at Lidl from the 24th August. Aldi and lidl do make me laugh with the random items they sell. I bought one a couple of years ago,they are not very good I returned after one day,and bought one on ebay and bought a decent airbrush.You can get cheap china airbrushes very cheap whick will be fine for starting .